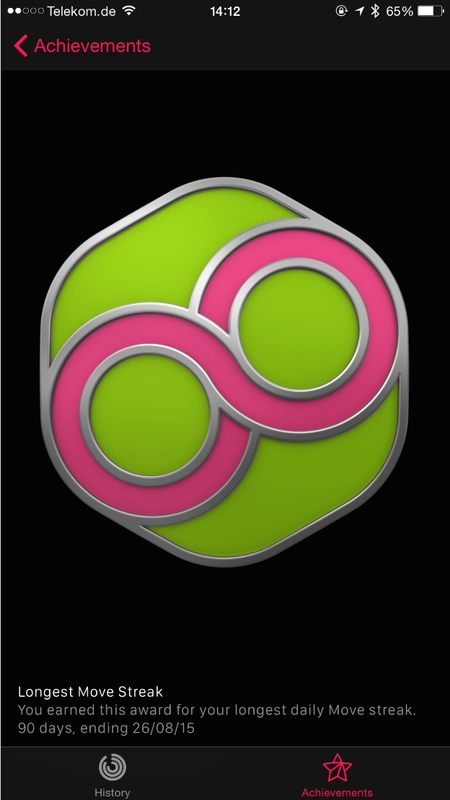 I have been using Apple Watch for 90 days. Why I know it's 90 days? We'll get to that later. There have been some surprises, but generally speaking, it has exceeded my expectations. I do not want to be without it. One of the things that have changed very quickly was my watchface. 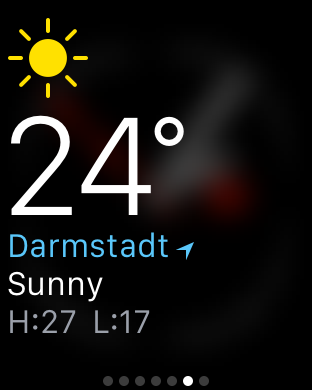 At first I added four 'complications': battery status, outside temperature, activity tracking and stop watch. Then I quickly found out that I needed neither one. Battery is not a problem, outside temperature is not that important, activities let me know when I reach them and a stop watch? Yeah, right. So I chose a very simple watchface shown to the left above. The other one is the watch face when I am traveling. 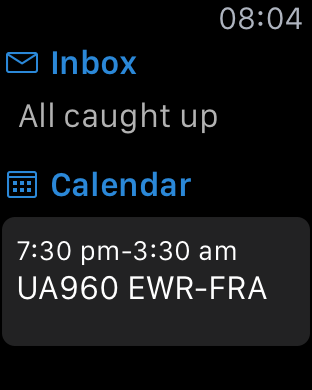 It shows my home time zone (Ute), the temperature (in the US you can hardly ever know because it's always freezing inside) and my next appointment. 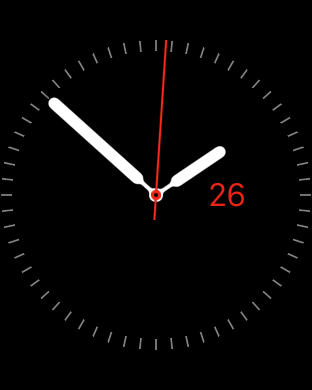 I also put numbers on the watch face so I am not messing with am/pm time notation. I use one third party app on the watch. Just one. That's Outlook. It just works very well. That of course means I also use Outlook on the iPhone. Again, a very decent app. The only surprising thing is that its calendar does not obey the 24h time format I set on the iPhone. Most of my interaction between Watch and me happens in glances. Glances are panels below the watchface. Swipe up and you get to the last used glance. As you can see, I am only using seven: Settings, Now Playing, Heartbeat, Activty, Outlook, Weather and Battery. The Battery glance is the only place you can see how much juice is left in the battery, and frankly, you don't need to know. Just charge Watch at night for an hour. For me it lasts two days. 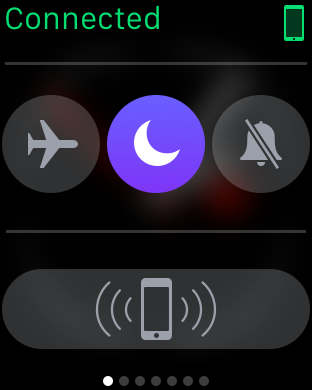 The Settings glance lets you set Flight Mode, Do Not Disturb and Silence. And you can ping your phone. It will make a sonar sound so you can find out where you left it. My favorite preinstalled app is Activity. You know that since I have been going on and on about it. It's simply the best activity tracker I have seen so far. And I have seen a few. I have not missed a single day without achieving all three goals. 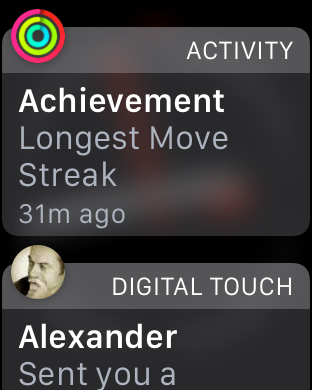 And since I get a Longest Move Streak award every single day, I know that I have been wearing Apple Watch for 90 days. The move streak is actually quite longer. 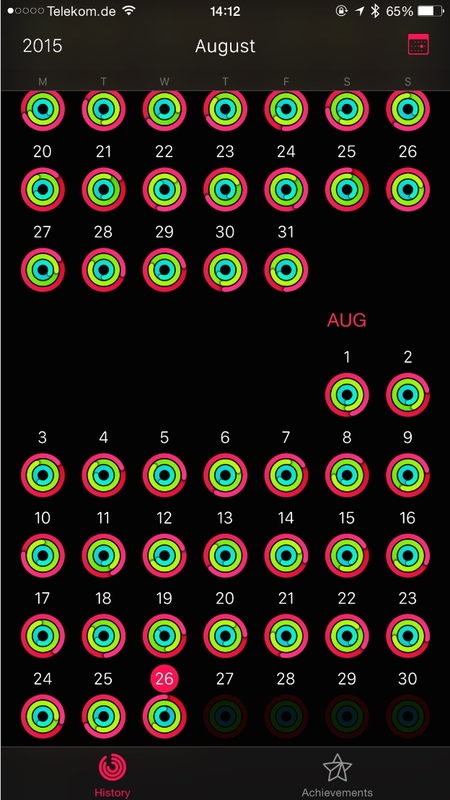 The last time I did not meet my move goal was last October, and that's more than 300 days ago. 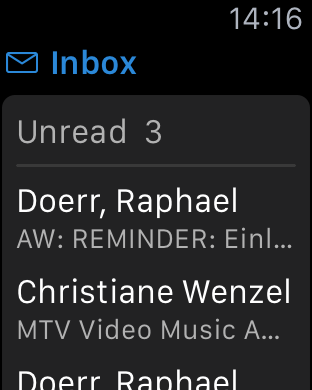 Notifications is the other big use case. I have tailored my notifications quite well, so the watch does not interrupt my flow. That's very personal. Some people will want to know about each and every email they get, every new follower, etc. But Watch makes it quite easy. Every time you receive a notification where you think 'ah, I did not need to know this right now' you just go ahead and tune your notifications. After a few days you will have it all sorted out. The one thing that I am not really using at all is the friends button under the digital crown. There is a simple reason: I use Siri instead. It has become quite natural to tell the watch what to do. 'Set an alarm for 7:30'. Boom. Done. 'Set timer to 10 minutes'. Boom. Done. Yes, you can do that on your phone. But that is not attached to you. Or it may be attached to you, but not to me. 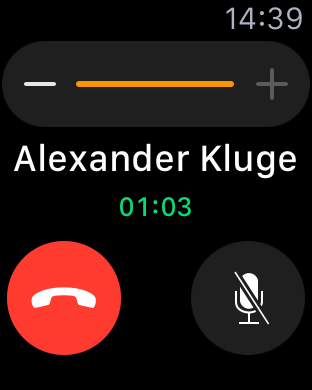 Speaking of which, I often answer the phone from Apple Watch. And that works way better than I expected. I don't really know how it does it (I assume Wifi), but I can be quite far away from the iPhone and still answer it. 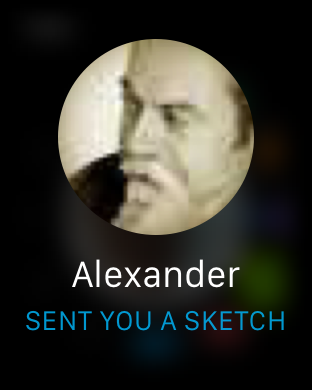 Talking to your watch feels a bit funny at first, but then becomes very convenient. 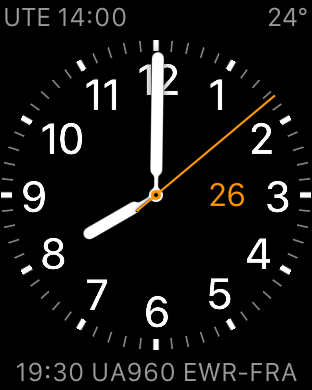 I am very much looking forward to watchOS 2. There will be more and better apps once the SDK becomes available. My son wants one (I bought one two months ago). I'll wait out the new, the new for my (wifi, fully submersible, etc, etc) and the old one for my son. Martin, you could be waiting for a long time. Thanks for the detailed review. I have had mine for several months, too, and like it. I'm curious if Apple can make it work where I can leave my phone at home and still: get calls, send & receive texts, check calendar and do maps. 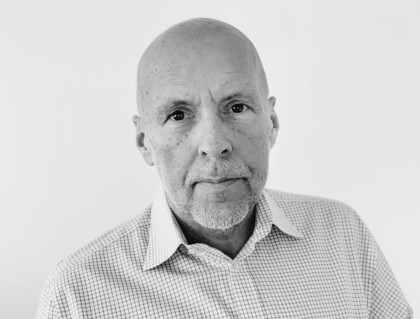 To me, that is a big deal since it will help address the addicted-to-phone syndrome. Can leave the phone in the car or even at home, enjoy dinner and know I can be reached if the babysitter calls. Any issues with damp finger presses? I find it doesn't consistently recognize button taps if my hand is damp/sweaty. Which is an issue when I'm trying to say I'm done with my workout. Seth, Watch has to connect somehow. The current options are Bluetooth and Wifi, actually combined. If you wanted to leave your phone at home, you would need something like LTE to connect. That is too expensive in terms of battery today. This might change. Actually I believe a future watch will have that capability. Replacing addicted-to-phone with addicted-to-watch does not solve anything though. Damp finger presses? I have not noticed these issues. Hands are usually dry when I touch the watch. Just licked my finger and it does not seem to make a difference. Have had my watch for three weeks now and still not sure I consider it worth the money. In terms of apps / new or more efficient way to do things I am not wowed so far. One thing I really like is setting timers on the watch via Siri, but that alone is hardly worth the money. I am hoping that OS 2 and native 3rd party apps will change the picture here. 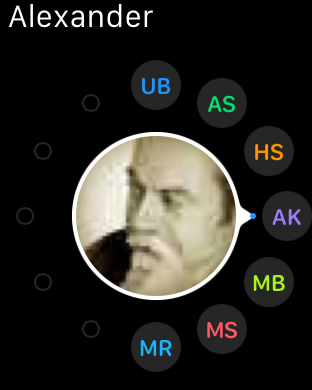 The main feature I bought the watch for is activity tracking, and there I am not happy so far. 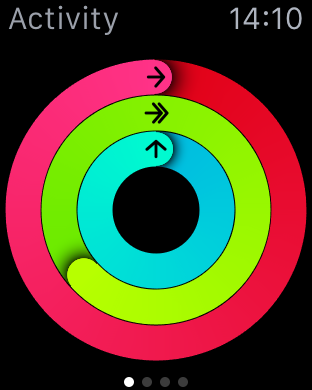 My main issue is that my iPhone and the watch disagree on distance tracked. I will start tracking with Runtastic on the phone and the Workout app on the phone, and on a 11km walk with the baby jogger I will get about 1km difference between the two, with the watch tracking the smaller distance. The difference emerges when I enter the woods. In the clear both devices track exactly the same distance. But when foliage covers the sky the difference starts to mount, with the watch tracking much less distance than the phone. I very strongly suspect that it is the watch / the Activity app that is at fault here, based on subjective assessment of distance walked, but also based on long tracking history with the phone that has been producing consistent results (ie same distance clocked at exactly same waypoints). I haven't fully figured out what's behind this. It suspect it has to do with weak GPS signal, but since both phone and watch use the same sensor that shouldn't make a difference. 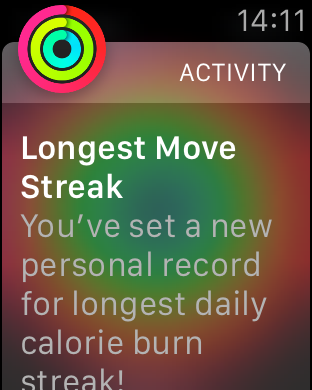 Maybe the watch / Activity app switches to counting steps and estimating distance when GPS gets weak. If that is the case the baby jogger might play a role, too, as holding on to the bar of the jogger can confuse the tracker and lead to too few steps counted (I had that issue when I switched from UP24, which counted steps well in that scenario, to UP2, which apparently had different correction algorithm and counted way too few steps with baby jogger). Haven't had the opportunity to test my hypothesis by walking my usual route without the jogger. Might be a very special usage scenario and hence no issue for most other people. But it is my usage scenario, of course, so matters massively to me. Bought Apple watch sport band black. Used it for abt. two weeks, every day, but not at night. Liked the design, high quality of material etc. and most of the apps. But I found it too small for my fingers, despite zoom function. I needed my reading glasses mostly. And as I did not wear any wrist watches for many years (decades ...), I just could not get used to the "Apple feeling" on my wrist, either left or right. I found the weight too heavy, and didn't like the sweat under the band when walking. And - last but not least - there's a feeling of "Protzomat" ;-) I couldn't stand. Less is more, so I stay with my rather new iPhone 6 plus, which I am very happy with. Just to mention: Replaced the iPad 2. Well, just a different experience. Would be interested to know who returned the Apple watch as well. BTW: return & money back was no hassle at all. Perfect customer service. GPS coverage is the problem here. When GPS signal gets weak, location starts jumping around. That leads to a much longer track if you simply measure distances between points tracked. This is where you need to smooth out the track. Different algorithms come to play so even with the same data, you get to different results. The watch needs accelerometer data. If you hold your hands still, you start making life more difficult for the watch. One thing the watch does is to calibrate your stride by relating GPS tracks with steps walked. That is why Apple recommends calibrating the watch with the Workout app in good GPS conditions. The benefit of Activity is that it does not only measure steps. it also makes you exercise and prevents you from sitting all day. I never had the expectation that Apple Watch changes big things. And it does not. It's the little things that make the difference. Lots of little things. you are using Runtastic and the Workout app simultaniously? I do the same withe Nike+ and from my observations it seems that if you do so only Runtastic/Nike+ uses GPS. The workout app most probably switches to counting steps. Using the workout app without another app running gets correct GPS results again. For me it doesn't have anything to do with clear sky or the woods. Just with distance. While after the first km they are still on par the difference increases slowly with every kilometer (some of my running tracks are no woods at all). The good news: Since I use iOS9 public beta the difference got much smaller. Still a difference but I saw the same approx. 1km on 10km difference before wich now went down to about 400m on 10km. Still wondering why results improved by updating the iPhone but not the watchOS. But after reading Volker's post I think the watch may not relate totally on steps but occasionally still use GPS while using another app. Maybe the either increased the algorithm and/or poll GPS more often now.